Nice Weather , Good Weather…. Bugs flying…lots of small winter bkack stones, gray midges…..we did well with small Black Wire Baetis and small black stones. The guys did pretty well as we landed maybe a dozen to 15 fish before lunch. We took a quick lunch break and then headed uphill to another part of the river. Tons of snow covering the banks , hard to get in in places as the banks were frozen and slippery. We got back in the stream and fished a couple long stretches and landed another 15 fish or so. I am guessing maybe we landed about 30…a mix of rainbows , browns, and brook trout. The largest fish was a 17-18" brown trout landed by Scott. The days are getting longer, we had fishable light til 6pm….ordinarily we would be done before then but we had gotten a late start due to the freezing rain advisory this morning and having to sit still on the highway while a road crew and state troopers cleared an accident and a downed telephone pole. Headed back, looks like two days of 60F plus weather coming and then spme heavy rain for Wednesday. Could be a 1 to 2 inch rain event…and right on top of soggy ground that will mean flooding. Mon. 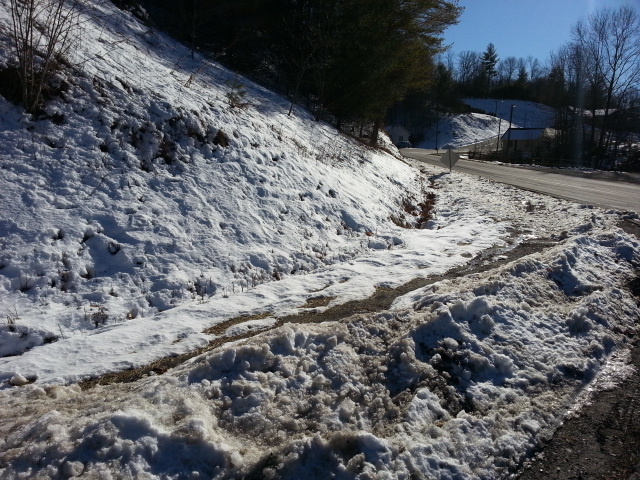 Jan. 28, 2013….Chilly morning and freezing rain advisory in Mtns. Guiding David Howard and a friend of his and we are heading through the hills on the way to our fishing. Looks like we will be fishing in above freezing temperatures for the first time in two weeks. Another Day or So and the Deep Freeze is Over…..Til Next Friday! Sat. 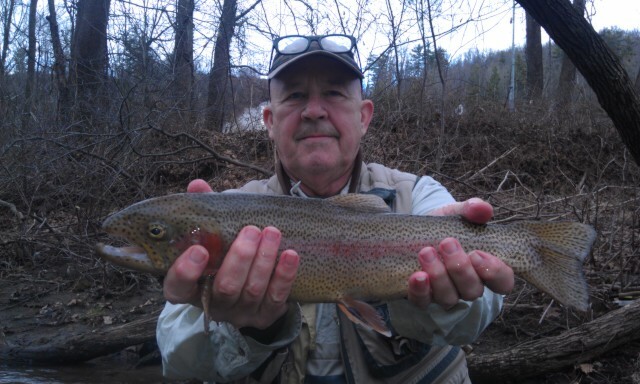 Jan.26, 2013…Had a trip scheduled today with Dr. Jason Steinbicker and we postponed and will be rescheduling as the South Holston was unwadeable/unfishable due to midnight to midnight full generation releases. Its been that kind of two week period..crazy. Can’t remember the last time I postponed a week’s worth of trips….counting the last two weeks we’ve missed a total of 10 booked days. The weather has been that cold and unsettled. We had two decent days earlier in the week, the last one with Mike Wood, Dave Link, and Jim Beeson. Fishing in 15-20F temps and 33.5F water we managed a 30-35 fish day. In case you haven’t tried it, that is hard to do! So I feel both blessed and fortunate to have gotten at least some time in. After yesterday’s Ice Capades, the weather becomes more tranquil along with temperatures pretty close to normal for late-January. Skies will be partly cloudy today and Sunday, but with clouds increasing Sunday afternoon. A bit of light rain or light freezing rain will be possible Sunday night before milder air overspreads the region for Monday and culminating on Tuesday….Full Report here . A day or two more of cold and looks like we’ll have a huge warmup with two days in the mid to upper 60s….midweek next wk. But don’t get used to it, cold and snow returns late week and looks like Fri and Sat might be interesting….we’ll see. Thurs. Jan. 24, 2013 ……Today marks a rare event in our guiding…..cancelling a trip due to cold temps and frozen conditions. I had a trip scheduled today but postponed it after my client Dr Pat Burney and I talked about conditions. 16F warming up to around 20F balmy degrees…20-25mph wind blowing across 6 to 8 inches of snow and a mix of snow and sleet on and off all day….Sound delightful. ..? Pat said "I would rather not……" And after being out in it all week I could only agree. We could have caught fish….have done it all week even in some very difficult conditions…..but somedays if the wind is too stiff things get really interesting. At 28F or 29F and down you will have Ice in the guides. Not might, ….will. At 20F you will have ice in guides and it will freeze on the line. Below 20F and you will have the last foot or two of the rod so frozen with ice that casting more than half a dozen strokes will cause you to lay the rod and reel down on the bank and spend a few minutes breaking all the ice off the rod tip. And stripping in line or a fish…..forget that altogether unless its a cast or two right after you have de-iced your rod tip. Its times like this that you will never question your manhood. Your sanity maybe, but not manhood….lol. The past few weeks have been the setup for the Perfect Storm…. Heavy rains with temps hovering around 33-35F then plummeting temps with 4 inches to a foot of heavy snow….then a week of temps with nighttime lows between 8F and 18F….and daytime highs not making it above freezing. Two days this week we caught fish in water that was 33.5F….so fish do feed. But its been bitterly cold for enough days now that there is an ever increasing amount of frozen river to deal with. And with this the fish are almost always going to be in the slowest secondary water or currents…the places you would normally stand…thats where you fish when its really cold. Trouble is though, guess what areas are the first places to freeze over…?….You guessed it…those slower areas where the fish you want to catch are holding. Looks like this current weather pattern is holding through the weekend then a warmup next week into the 60s for a few days. Until then, we have a few more days of really cold weather ahead and another potential Winter Weather Storm event tonight into tomorrow evening. Sweet……. Looks like a great time to sip some coffee, put a bluegrass CD on, throw some more wood on the fire, and get to tying flies……. Have a great one….will have an update on fishing conditions if I happen to get in Saturday’s trip with Dr. Jason Steinbicker. Have a great afternoon. ..! One of the Coldest Fishing Days in a Long While…. Tues Jan. 22, 2013….Knew it was going to be a cold one but man was it ever. 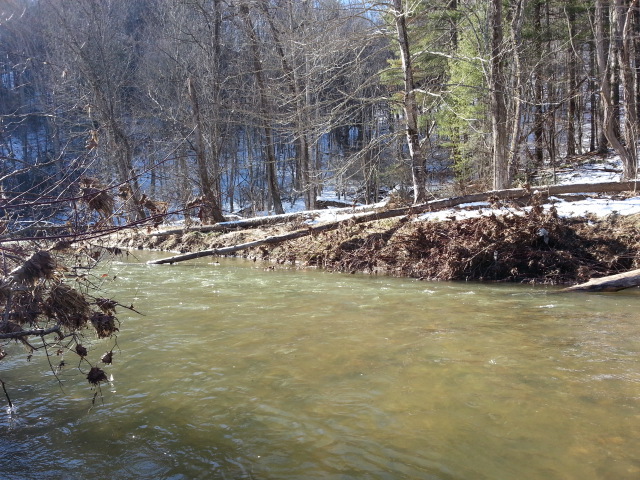 Fortunately water levels were still up from recent rains which insulated us from a frozen stream. When we started it was 15F and a stiff NW breeze . I was guiding Mike Wood, Dave Link, and Jim Beeson and the guys wanted to fish so we hit it hard. Things were slow to get going with the bitterly cold temps but by 11am we started picking up a few fish here and there. It was especially chilly but pretty with almost half a foot to 8 inches of snow still lying around and drifts up to knee deep in shaded spots. By lunch time we tallied about 15-20 fish, a mix of rainbows and brookies. We took a short break, had lunch in a warm truck, then we were back at it. Temps struggled to reach the 20F mark and we never got more than 3 or 4 casts before the rod tip and guides would freeze up. Ordinarily a bit of Vaseline does the trick but not as cold as it was today. We hit two stretches where I felt we could catch a few more before bitter cold and dropping temps would force us to quit. We hit one more good spot, two deep slow holes that held a good many fish and we got about 10 more fish to end with about 30 or so for the day. Not bad for a day I felt like we might struggle to catch numbers of fish. It turned out to be a good day. We pulled away and left plummeting temperatures and headed back. The next day or two is going to be a hard time to fish in the higher mountains. Too cold, if you call lows in the single digits and highs in the high teens to low 20s. Tues. Jan. 22 2013….No other words describe today..met my guys for the day, Jim Beeson, Mike Wood, and Dave Link . We are heading in an Artic freeze. More to come…..
New post Winter Storm on The Way…. 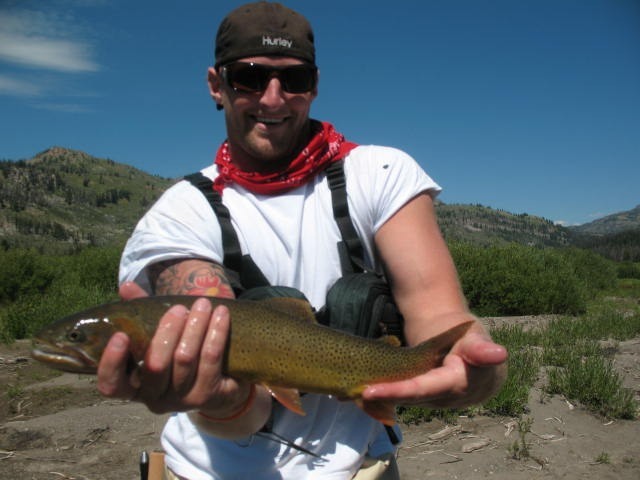 jwflyfisher posted: "Thurs. Jan. 17, 2013…..Its beginning to sound like a broken record. Had a great day on Saturday 1/12 guiding Dan Mara and Ron Morris, and had trips booked Mon, Tues, Wed, and today and postponed them all due to flooding…..4 days of trips…now we are"
Winter Storm on The Way…. Thurs. Jan. 17, 2013…..Its beginning to sound like a broken record. Had a great day on Saturday 1/12 guiding Dan Mara and Ron Morris, and had trips booked Mon, Tues, Wed, and today and postponed them all due to flooding…..4 days of trips…now we are looking at more heavy rains and a Winter Storm developing to our South that started as an ‘upper level disturbance’ and now has grown into a powerful storm…and now the weather folks are calling for a snowstorm with 6-12" of snow in the High Country, 4-8" in the Foothills and Piedmont, and as much as 1-3" all the way to the coastal plain of NC. Ray’s Weather in Boone is calling for this and some isolated higher amounts at higher elevations and at favored locations on west-facing slopes along the NC/TN border. A lot of folks have hit or miss forecasts but Ray is usually right on the money. He and his team of meteorologists are from the area and understand the area and all the microclimates in between…..and usually give great forecasts. Quite simply, its the only one I trust …..they are that good! A quick update on conditions, other than local lakes and ponds—- tailwaters in VA , the Smith , Jackson Rivers, and TN (South Holston, Watauga, Clinch R, Holston/FT Patrick Henry Dam) – – – these places are the only ones that you are likely going to find some fishing. In a lot of instances the dam protects the river from runoff so long as incoming tribs don’t foul things up with run off. On the SoHo, Watauga, Smith, and Jackson Rivers its possible to get above some of that and find fishable water. And releases are favorable because the TVA generally doesn’t generate when downstream there’s flooding taking place and to release water would only make it worse. 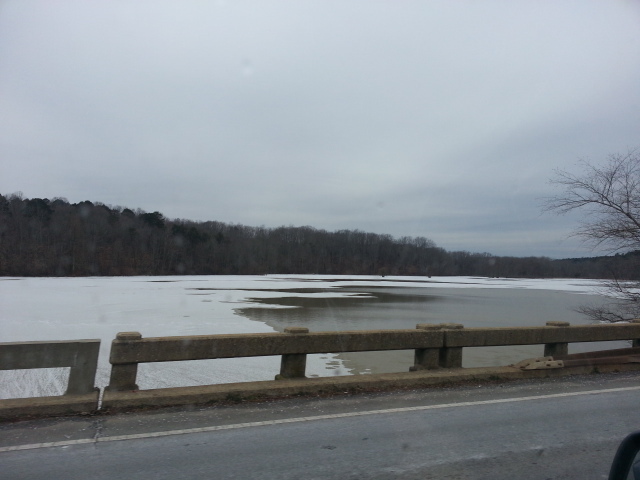 Seeing this right now on the TN tailwaters…that is what they have done for several days now. Will be doing at least one trip out in it regardless later today, or tomorrow, so long as the TVA keeps releases the same. On a different note, here’s some great video for you. I posted some of these on our site late yesterday, this is a SIMMS clip called TROUTPRON…and its a video of large fish tracking down a big foam bug and smashing it. It reminds me of the lake fishing we do in Wyoming on our August trip. This is much the way the native cutthroats there do when they go for a big dry fly…which is what we are fishing to them most of the time…. Also, Sage has developed a new rod that reinvents and redefines slow action….these are called SAGE Circa rods. In their words, "….in the pursuit of Fast we reinvented slow.." what a nice rod it is. Sage rod designer Jerry Siem, who I used to meet up with to cast new rods at the trade shows in Denver, Colorado and Salt Lake City, Utah, has outdone himself yet again. Here’s a rod that uses modern materials and technology to create an action much like fiberglass or bamboo….sans the weight that is a problem with either of those two materials. Its a great rod, you can read about it on the Sage blog here, and check out the video below…. In keeping with our last newsletter in the ‘Learning Skills’ department, we did a piece on our fly fishing blog that appeared in our newsletter and it was on hook setting skills. If you missed that piece, you can check it out here . 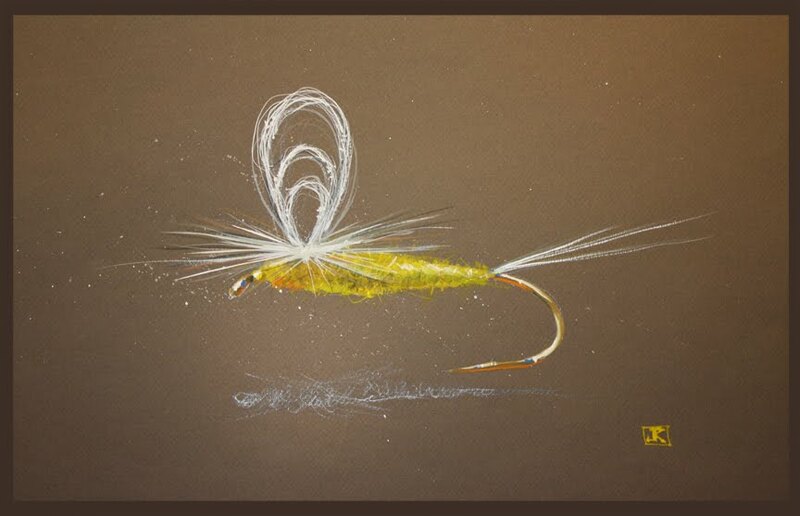 Also, here is a new piece that is on the current month at Midcurrent, one of our favorite flyfishing blog sites. It is a piece on "Sweep setting", and it has direct and certain application on fishing here on our waters. Its applicable in any situation where you are fishing at a right angle to the current, or perpendicular to it…..beside the fish rather. You can check out this piece on Sweep Setting here . 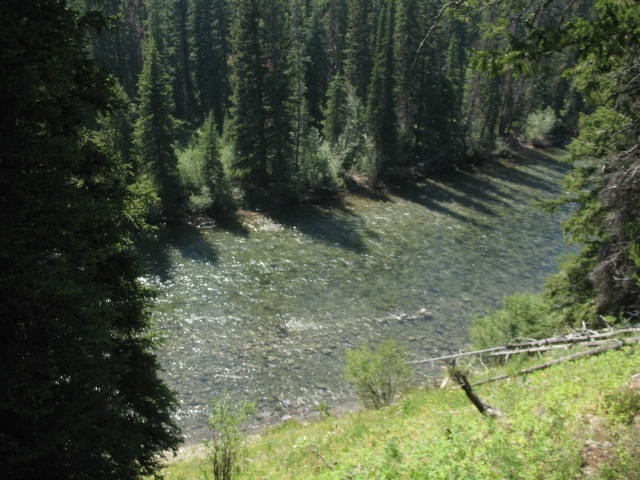 One of the best views on our Wyoming trip, I took this photo while on a horse, on the high bluff trail overlooking the Buffalo Fork of the Snake…its about 800 feet straight down to the river….."Hi mom…..look , no hands!" This view is early into the 8 miles into camp …we get away from everything….literally! Thurs. Jan. 17, 2013…..Its beginning to sound like a broken record. Had a great day on Saturday 1/12 guiding Dan Mara and Ron Morris, and had trips booked Mon, Tues, Wed, and today and postponed them all due to flooding…..4 days of trips…now we are looking at more heavy rains and a Winter Storm developing to our South that started as an ‘upper level disturbance’ and now has grown into a powerful storm…and now the weather folks are calling for a snowstorm with 6-12″ of snow in the High Country, 4-8″ in the Foothills and Piedmont, and as much as 1-3″ all the way to the coastal plain of NC. 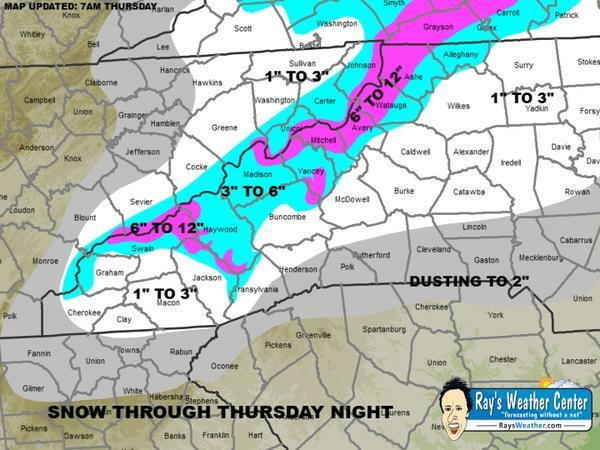 Ray’s Weather in Boone is calling for this and some isolated higher amounts at higher elevations and at favored locations on west-facing slopes along the NC/TN border. A lot of folks have hit or miss forecasts but Ray is usually right on the money. He and his team of meteorologists are from the area and understand the area and all the microclimates in between…..and usually give great forecasts. Quite simply, its the only one I trust …..they are that good! Also, Sage has developed a new rod that reinvents and redefines slow action….these are called SAGE Circa rods. In their words, “….in the pursuit of Fast we reinvented slow..” what a nice rod it is. Sage rod designer Jerry Siem, who I used to meet up with to cast new rods at the trade shows in Denver, Colorado and Salt Lake City, Utah, has outdone himself yet again. Here’s a rod that uses modern materials and technology to create an action much like fiberglass or bamboo….sans the weight that is a problem with either of those two materials. Its a great rod, you can read about it on the Sage blog here, and check out the video below…. In keeping with our last newsletter in the ‘Learning Skills’ department, we did a piece on our fly fishing blog that appeared in our newsletter and it was on hook setting skills. If you missed that piece, you can check it out here . 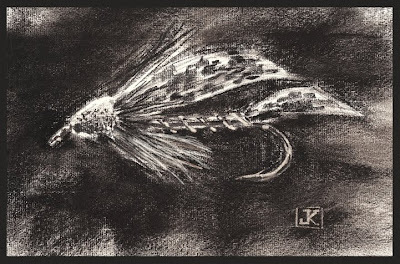 Also, here is a new piece that is on the current month at Midcurrent, one of our favorite flyfishing blog sites. It is a piece on “Sweep setting”, and it has direct and certain application on fishing here on our waters. Its applicable in any situation where you are fishing at a right angle to the current, or perpendicular to it…..beside the fish rather. You can check out this piece on Sweep Setting here . One of the best views on our Wyoming trip, I took this photo while on a horse, on the high bluff trail overlooking the Buffalo Fork of the Snake…its about 800 feet straight down to the river…..”Hi mom…..look , no hands!” This view is early into the 8 miles into camp …we get away from everything….literally! 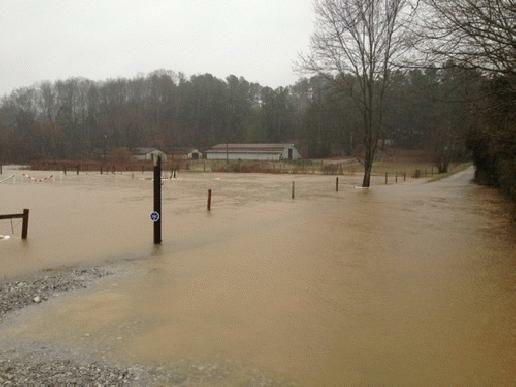 Tues. Jan. 15, 2013……Yes wet is the word, I can attest to that. Rain in the amount of 2.5 to 5.5 inches depending upon location. We have now postponed three trips so far this week including tomorrow’s trip with Clay Bolick of High Point, NC. We had planned on fishing a couple NC waters/locations but then after watching the movement of this stalled out front and the waves of precip moving along the front it just looked worse and worse. We set on heading to Escatawba for tomorrow, as it was flowing an ideal 170cfs as of 3pm, but upon setting that as our fishing location for Wednesday’s trip the flow spiked up to an unwadeable 527cfs. So much for that. This is the time of the year folks are mending gear, tying flies, learning or working on new skills, making preps for the upcoming season. Some folks consider winter the ‘off season’ or our ‘slow time of the year’…but that couldn’t be further from the truth. Its one of our busiest times. 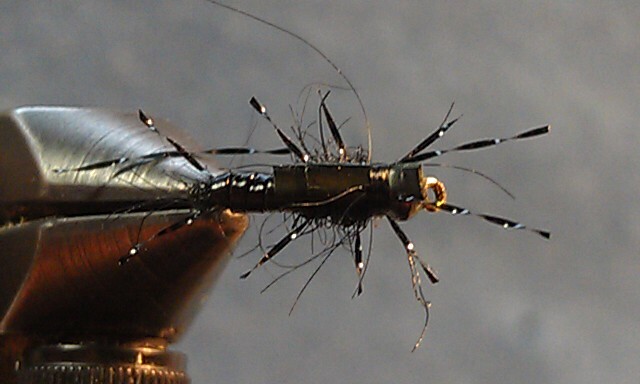 We are currently running several classes, our upcoming Knot Tying Class at GTCC slated for Jan 29, 2013 is FULL and so is our Beginning Fly Tying Class slated to begin on Jan. 30, 2013. I know there are instances where some folks can’t make it to a class, or for whatever reason have a conflict and can’t make it. For those situations I also offer private instruction, and I can come to you if that works better for you. I do these lessons hourly and by appointment. Have been getting a lot of trip bookings for future trips, our Feb. 5 Escatawba trip, which we are offering at our Winter Special price of $185 (normal group rate is $250)….and we have 2 spaces left. If you are interested you can book your space here . 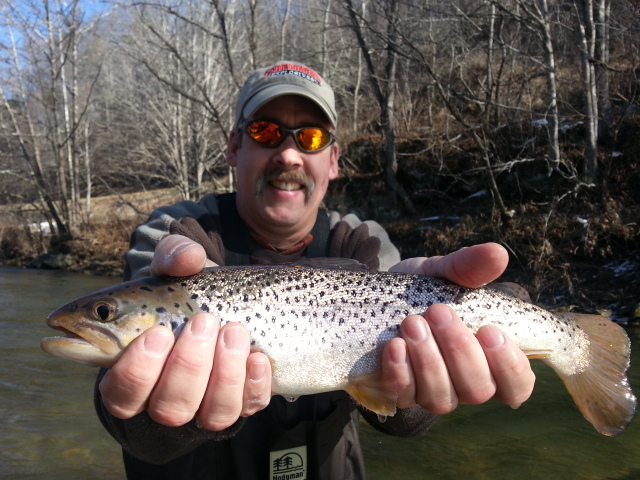 Our May South Holston mayfly madness trip May 14-16, 2013 is filling up too, we have space for two more folks….if interested you can book your space here . The other trip of ours that has been very popular is our annual summer Wyoming Sampler Trip to the Grand Tetons, Jackson Hole, Wyoming. We currently have 5 spaces booked and one opening left. You can book your slot here . For any trips and particularly the Wyoming trip I will gladly meet with you over coffee, lunch, or dinner and present the trip to you with photos, videos, and other information about this fantastic trip. 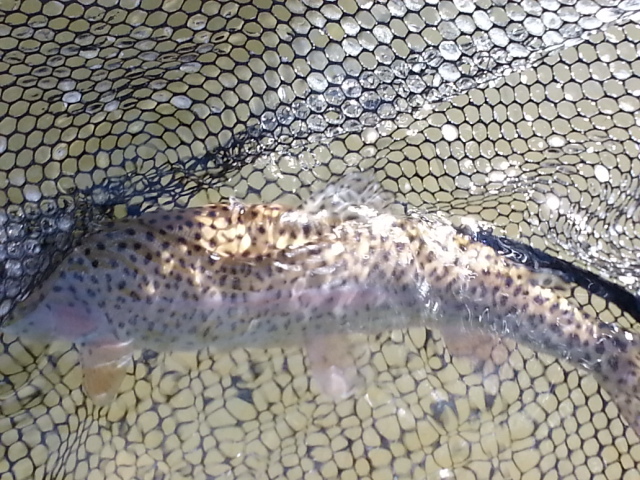 Here are a few pieces written from a past Wyoming trip……. Also, winter is a great time to listen to podcasts…one of my personal favorites is Tom Rosenbauer’s podcast at Orvis. Its a great way to learn and pick up a few tips, particularly when the weather is as nasty as it has been this week. Of Tom’s recent podcasts I particularly like the Ten Tips for Winter Fishing, and Tips for catching large fish, and Winter fishing tailwaters. All have some great information. Another great resource is Ask About Fly Fishing. Here’s a great one, its called Reading Water by Gary Borger. We’ll be rounding out our week guiding two trips, conditions permitting. Thursday I’ll be guiding a client from Winston-Salem, NC, Dr. Tom Wolff. On Friday, I’ll be guiding another one of my regular clients Dr. Pat Burney from Greensboro, NC, we’ll be fishing a NC location as long as conditions improve. Looks like a little more rain tonight and Wednesday and then hopefully this mess will be gone. Have a great evening ………Good Fishing! 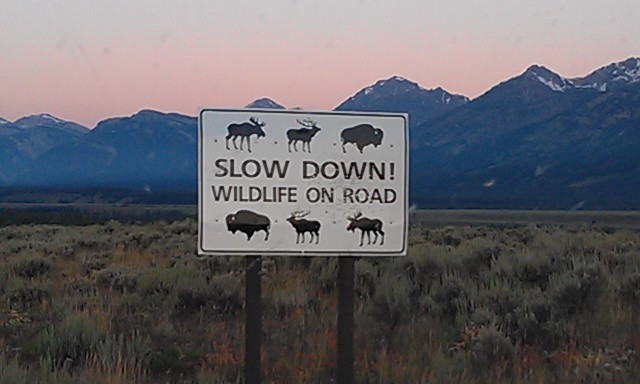 A sign near one of our well traveled spots in August, Antelope Flats near the community of Kelly, Wyoming……the sign is accurate….Better pay attention! Good Day, Warm and Wet…. Sat. Jan. 12, 2013…..Good day so far guiding Dan Mara and Ron Morris…about 30 fish and one giant rainbow by Ron on one of my #18 Little Winter Black Stone nymphs. Caught all our fish nymphing. It’s been a gray, dark day with on and off showers. Water temp has risen from 35F to almost 50F after three days of warm temps….